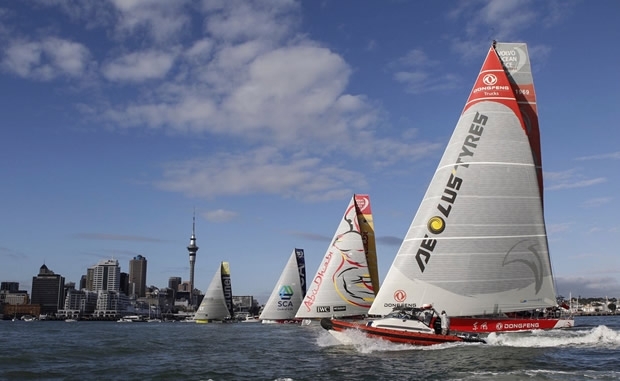 After a 67 hour delay to let Cyclone Pam pass by, leg five of the Volvo Ocean Race set off from Auckland at 0900 local time (2000 Tuesday UTC). While it was the danger of high winds and huge waves associated with the cyclone that kept the fleet at the dock on Sunday, this morning’s start was somewhat anti-climatic, in relatively flat seas and light breeze with Code Zeros as the sail of choice to sail out of the Hauraki Gulf. Dongfeng Race Team made the best of the start, held off downtown Auckland, and led the boats away from the popular New Zealand stopover on to the Volvo Ocean Race's only 'proper' Southern Ocean leg. The postponement to avoid Cyclone Pam has led to some mixed feelings in anticipation of the leg that will see the boats round Cape Horn before heading back up the Atlantic again to Itajaí, Brazil. Cyclone Pam will no longer be a major factor for the fleet, added Infante. For the crews the next landfall will be Cape Horn. On the great circle this is 4472 miles from Auckland, but to keep the boats away from ice, but to keep the boats away from ice they have adopted a similar system to the Barcelona World Race with a series of marks (no less than 24) which the boats must remain to the north of. If the boats follow the ice points it adds around 300 miles to the race course. The boats are expected to arrive in Itajaí around 7 April.